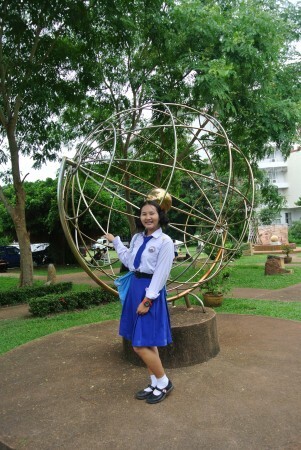 Today we went to the science fair at Ubon Ratchathani University. We left at around 9.30 and travelled on the school bus with some of my G.12 students. I don’t remember much of it, but my students have now seen how I look when I sleep on a bus. I was still a bit tired from not feeling well the day before, so I did not care so much and was grateful for the extra sleep. Once we got to the university we were ushered into plastic gloves and on stage with our science equipment. Two of my G.12 students were translating for all the 20 people who were watching our experiment. Everything went well. Kate’s ‘magic water’ partially separated, Toffy picked the right beaker after some direction for Eilidh’s magic science trick, my nappy opened after some persuasion, and Hannah’s volcano almost set the stage on fire – but no one noticed! So really it didn’t go too badly. 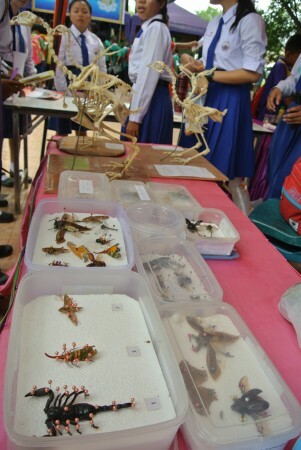 After the experiment my G.12s Toffy and Fang showed us around the University and we went to different stalls. They had maths and science games there. I felt a little odd being surrounded by science and maths students as an English Literature student, but I stuck out anyway as an English person so it didn’t really matter. At one of the stalls I made cola slushi, which is similar to making home-made ice cream. But it used cola instead of milk. Kate and Eilidh played spot the difference between some Thai letters, Eilidh managed all six and won a handful of flavoured mentos. I was slightly jealous as it was around lunch-time and I was starting to get hungry. 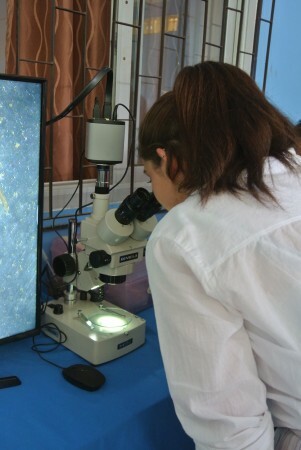 We went round one of the buildings, in different classrooms there were science exhibitions about biology, chemistry and physics. The first classroom we went into was filled with balloons. Hannah, being excited about her birthday coming up, decided that they were meant for her instead of the exhibition. Once we had looked around the classrooms, Toffy and Fang took us to the canteen to get lunch. After some confusion about what we actually wanted to eat, the six of us squished onto four seats and enjoyed our meals. We then walked some more and bumped into Poom, one of my G.11s. As we walked with him we managed to lose Toffy and Fang. After realising they were probably stuck in a queue somewhere we carried on. We came back to the stage area where we did our experiments and decided to find the candyfloss stand we had passed earlier. The vendor was selling green, pink and blue candy floss. I bought blue and pink candy floss in a bag, which turned purple where the two colours met. We then went and sat in the dinosaur park at the front of the university and some more G.12 students, including Toffy and Fang, joined us. We saw some boys from another school climb up one of the dinosaurs and made it look really easy. We then went to try it. Eilidh went up first and I decided to take some action shots. She got about halfway up the dinosaur and she now has a photo of her falling from the dinosaur on her phone. She managed to land fine, she just scrapped her leg and made a previous mosquito bit bleed. But apparently that was enough for the students to send us to sit down at some benches so we didn’t get ourselves into more trouble. The four of us then sat around until it was time for us to take the school bus home at around 2pm. When we got back to school Ben said that we could rest in our rooms that afternoon, which I was extremely glad about. I don’t think I will ever complain about the air conditioning on public transport in the UK again after being on that school bus.